OMG Posters! » Archive "Thunder" Art Print by Josh Keyes (Partial Onsale Info) - OMG Posters! 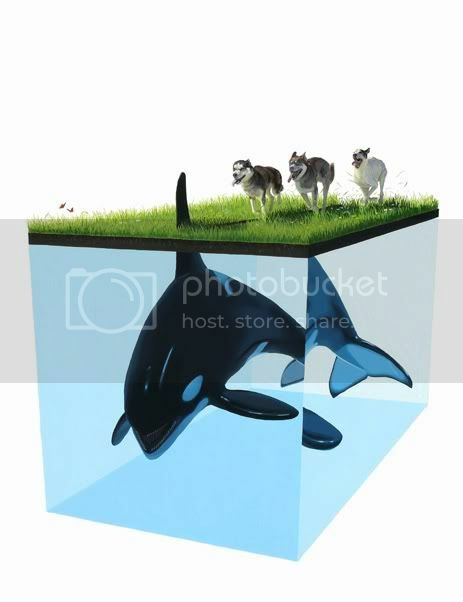 Limited Addiction Gallery is set to publish what is, in my opinion, one of Josh Keyes’ greatest pieces ever, “Thunder”. They will release it as a huge 24″ x 32″ giclee on July 15 for $395 (edition of 100). They haven’t announced the exact onsale details yet, but you can be sure I’ll keep you posted. Until then, visit LimitedAddictionGallery.com. Well, they both mammals, right? I thought the tail was supposed to be like the fake rabbit at those dog racing tracks. I like how people make ridiculous claims about the art without doing any research. I think it’s great that everything is hand drawn or painted, but i guess my question is, is a digital print the best way to reproduce that image? I am not talking about the original work of art, i think i am just making a comment on the one for sale. Has anyone seen the original painting who could chime in? LAG’s giclees are among the best I’ve ever seen. Very high quality stuff. I don’t think it would be plausible to accurately reproduce his paintings using screen printing. That’s good to know Stoney – I got a great giclee from noferin and I love it. Different mediums for different pieces. Really, in response to the people talking about the content of his work, I agree with you that his paintings have become rather redundant, but you have to hand it to the guy for creating such an attention grabbing, well liked, series of work. At this point in time, he is just playing into everyones madness. 400$ /print, 9899$ reposted on ebay. He could probably paint a pretty rock on an asphalt road and sell a hundred at that price. He is pretty awesome, and I would love to own one of his works someday, but enough with the madness. or maybe thats just my jealousy taking over… same thing with Jeremy fish, blah!